* Gets more done with less hassle. Garden hand tools are a pleasure to use if you know how. And when you have gardening tools that are well-designed for the jobs you do, then you'll really want to get out in the garden and use them. The information on this page will help you garden any ordinary sized plot with manual long handled garden tools. Power driven garden tools are on this link, small garden hand tools here. Check below and you'll soon be gardening with a smile. This page is about using long-handled gardening tools to remove weeds, cultivate and prepare soil for seeds and plants. I have other pages on using digging tools, and about garden spades and forks on these links. Hoe:- used between plants and rows to chop off annual weeds that grow from seed, - hoes are variously designed to suite particular jobs and gardeners live with their favourites - but check this link for more on hoes. shorter long-handled tools is more closely related to the particular job you want to do. Narrow borders and planted areas require shorter long-handles and a steep angle of attack using the 'Gondolier' method - see below. Long beds, new lawns and ground preparation, require original long-handles preferred by landscapers to make level ground using a shallow angle of attack. These tools can be worked from lower down the handle if necessary. Avoid cramps by gently warming up your muscles before the work starts. With long-handled tools loosen up your wrist and fingers with a few exercises. Keep an upright stand-easy posture. Hold the top end of the handle in a fist grip at about shoulder height and push down. The second hold is another fist grip lower down the handle. Use this method to work garden hoes with a short down stabbing action. 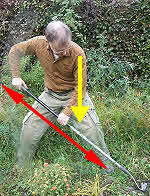 Close-up work with shorter long-handled rakes involves a steep angle of attack. Straight tines are best here. A sideways sweeping action can be used with soil rakes to gather stones and with wire rakes to make a seed bed. 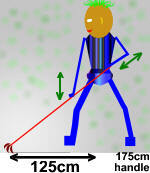 Stand astride and side on to the job like a sword fencer. You can adjust your height by flexing your knees. Keep an upright stand-easy posture. Your rear hand grips the end of the tool handle at about waste height and works backward and forwards. Your thumb is aligned along the shaft. The leading hand grips the tool part way along the shaft and presses down or lifts. Note: To give you a more natural ergonomic hold on long garden hand tools why not try adding the side grips available from this link. Compare with this range of garden hand tools. Easi-Grip Add-on Side Handles - U.K.
Leave long garden hand tools standing with their heads up. Standing on a rake head is no fun when the handle comes up to whack you. Always keep the tool head 'in-your-face' where you can see it. In the garden keep all your tools conveniently together. Lean them up against a fence but never lying around loosely or across paths where they can be tripped over. Sounds obvious? Well take a step back.